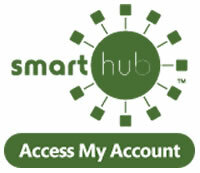 You can now access and manage your accounts online using SmartHub. SmartHub is a customer self-serve solution that allows you to manage your Southern Power accounts with mobile and Web apps in a secure environment. Sign up for online access today! You can manage your account right from your smart phone with SmartHub. Download the FREE mobile or tablet app and manage your account anywhere! There are several options available for payment of your Southern Power District accounts. Make payments for your Southern Public Power District accounts with SmartHub, which provides mobile and Web apps in a secure environment. SmartHub also allows you to review your billing, usage and payment history. You may set up recurring credit card payments on SmartHub, as well. Auto Pay is an electronic funds transfer payment. Once you are signed up, you will receive your billing notice(s) marked “Bill Paid by Auto Pay”. On the 15th of each month, funds are withdrawn from your banking account in the amount due on your billing statement. Payments can be made by calling our Customer Services Department at 800-579-3019. You can pay using your credit/debit card, with no fees, and we will also process a payment from your checking account by phone. Payments can be made Monday-Friday, 8 am – 5 pm. With Budget Billing, your monthly billing amount is established based upon the average of your bills and account balance for the last 12 months, divided by 11. You can mail your payment to Southern Public Power Distrct, PO Box 1687, Grand Island, NE 68802-1687. To be considered “timely”, payments must be received at this address on, or before the 15th of each month. Please allow 3-5 days for delivery. You can stop in to any of our area offices, according to the hours listed below. Credit cards can be used at our Grand Island and Franklin offices, all other locations will gladly accept your cash or check payment. The following banks in Southern’s service area are all locations where you may make your electric bill payment. Just choose which is the most convenient to you!